Greasemonkey is a Mozilla Firefox Extension that allows users to install User scripts that easily customize the way a webpage displays. So if you are Twitter Addicted and trying to customize your boring Twitter Web interface. then Greasemonkey Scripts really help you. With Greasemonkey Scripts, you can easily nest your replies, silence noisy twits,retweet to other services, and more. 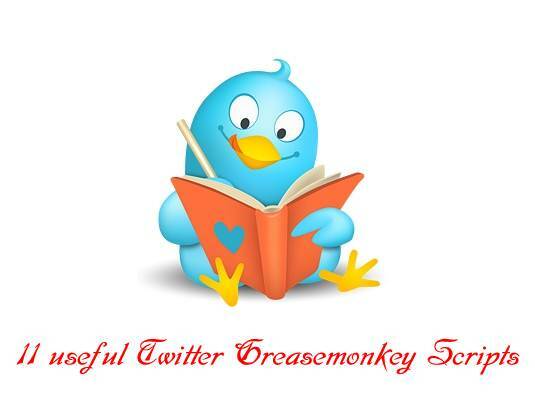 Here is the 11 Useful Greasemonkey Scripts for Enhance Your Twitter Experience. Nested Twitter Replies Greasemonkey Scripts allow you to adds nested replies to every Twitter conversation thread. When you install the script, it automatically retrieve and display nested replies for your Twitter conversation . Color Labels Greasemonkey Scripts allow you to add color label for each user in new design Twitter that allow you to easily manage your followers. Better Twitter allow you to Adds auto reloading, Preloading of next page when you scroll down, remember last read tweet, @reply highlighting with yellow color, auto-completion of friends names in @replies through Tab key, Sorts friends in the sidebar by there screen name, Minified Twitter layout when you resize your browser window to a width narrower than Twitter.com layout, inline reply form for easily reply to tweets without reloading the page,Live tweet preview, Google map for user profiles which have geo coordinates, and also Added retweet button below reply button on hover in timeline view, and in individual tweets. Retweet Greasemonkey scripts allow you to add a re-tweet Button/links to the tweets in your timeline and in timelines of other profiles . Intercepter replaces the all short and meaningless tinyurls with actual web site URL using the preview feature, now works on all websites. Now shoosh! is a very interesting Greasemonkey script which allow you to avoid people updates you don't really want to read right now but already you follow them. Now shoosh! will hide there update from your timeline, and if you wish to restore them again someday, you can. Summize Replies help you when Twitter wont let you view your replies. The 'replies' tab will link to a Twitter Search for tweets directed at you. Endless Tweets allow you to automatically Preload of next page when scrolling on the Twitter timeline. it's part of Better Twitter for Greasemonkey scripts. 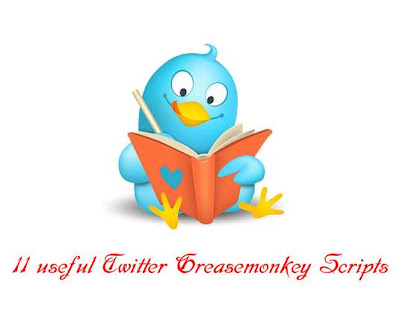 Read All Tweets Greasemonkey script is very useful for people who read all tweets on there twitter timeline. it display only unread tweets in the order beginning from oldest. Check new tweets every 5 minutes and add automatically. Grittr is a Greasemonkey script which allow you to Tweet stories, make Favorites Tweets, Retweets, Follow Tweeps and more directly from Google Reader. Twixxer is a photo and video sharing Greasemonkey script that work only with Firefox. User can easily share photo and video on Twitter. Others with the script installed will see thumbnail images, without the tool users can click on the link to go to the photo or video you have uploaded.